As a delusional, imaginative product of the 1990s, I always thought it’d be awesome to time-travel and be a teen in the 1950s. The war was over, Elvis was gyrating away that pelvis of his, Mom looked dandy in a string of pearls and saddle shoes were hot (clearly, an most important facet of the 1950s). And then there were those soda-pop shops. The ones where (I speculate) teens just like me sat on swivel-stools and ordered malts and soda floats and some diner lady who called you ‘shoog’ waited on you. Yeah, those soda-pop shops. Anyway, for whatever reason, some loser decided to get rid of those (I’m blaming the hippie movement of the 1960s) and now us kids of the 1990s only have Starbucks to fulfill our beverage desires. So instead of waiting around for a time-travel machine, I decided to combine my wacky perception of the swingin’ 1950s and my love of cupcakes into…drumroll please…soda pop shop cupcakes. Yes, children of any age. SODA POP SHOP CUPCAKES. And I plan on doing a series of them, too, which I’ll call my ‘soda pop sampling’. How cute! 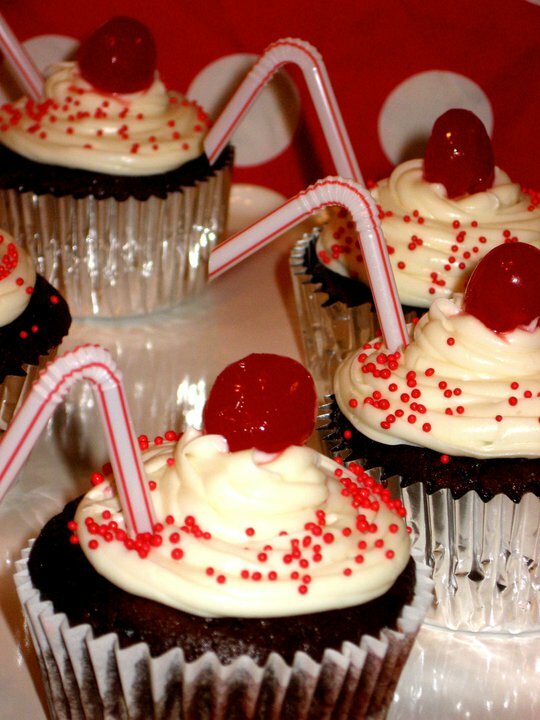 To kick off the soda pop shop cupcake series, I baked up a batch of delectable chocolate cherry cola cupcakes. These puppies are beyond tasty and took little to no effort (despite my staging efforts which I think looks pretty damn cute). 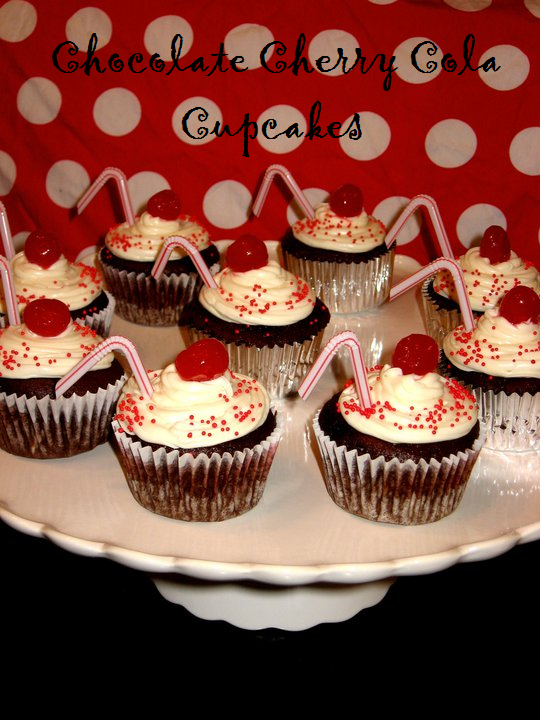 I topped each cola cupcake with some vanilla icing, red non-pareil sprinkles and a dried maraschino cherry. And last but not least, a snipped straw for slurping. HOW CUTE. I’m obsessed. And they were literally SO easy to make. Just two egg whites, a box of Devil’s Food cake mix (I used Pillsbury), some maraschino cherry syrup (about 1/4 cup) and a can of coke. If I had cherry coke, I would have used that, too, but kept the additional cherry syrup for more flavor. So voila, my chocolate cherry cola cupcakes, part one of the soda pop shop cupcake series 🙂 Enjoy! these look so good!!! will definitely make them.